RECAPTURED: Mark Royden Durant also known as Royden Williams called “Smallie”. 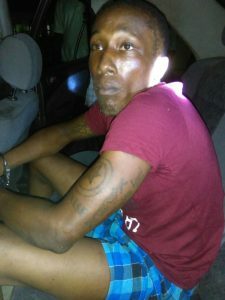 Prison Escapee, Mark Royden Durant also known as Royden Williams called “Smallie”, who evaded police gunfire in Linden last month, has been recaptured at Weldaad, West Coast Berbice tonight. Police confirmed the murder convict was in a passenger minibus when he was recaptured at about 20:00hrs as a result of an intelligence-led operation. The Bartica massacre convict was unarmed at the time and was not sporting his infamous dreadlocks, which many remember him by, due to media photos published during his trial. Durant’s new look did not fool ranks who apprehended him without incident. Last month, Durant was said to be in the company of ex-policeman and fellow prison escapee, Urie Varswyck, in the Central Amelia’s Ward area of Linden. The duo opened fire on the joint Services who returned fire which resulted in Varswyck, who was dressed in a military vest and boots, being fatally wounded. Durant managed to escape then. He was on the run since July 9 when a group of inmates set fire to the Camp Street jail, and in their escape bid, shot prison officer, Odinga Wickham, who later succumbed to his injuries. The fire destroyed the jail and displaced an estimated 1,000 prisoners.